The Andrew Sister's Wig is a long 1940's page-boy style wig. Available in Brown, Black, Blonde, and Henna Red. The wig features an elastic band on the inside for comfortable one size fits most sizing. 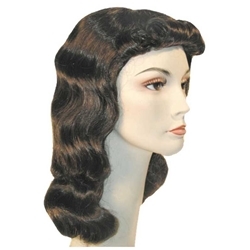 The Andrew Sister's Wig is a great addition to pin-up girl costumes, WWII era costumes, 40's career girls, army nurses, telephone operators, and a vast array of other characters.